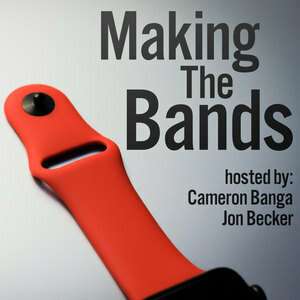 15 episodes of Making the Bands since the first episode, which aired on September 29th, 2016. In this episode, Cameron decided to pay $20 for the full In App Purchase inside of Ferrite for iPad, so that he could edit the entire episode on iPad. The results are a mixed bag. And we apologize for Cameron falling off the podcast for a thirty second interval or two. Also, our favorite part is at approximately the 45:20 mark. Cameron and Jon get their first sample watch bands. So it's time for some impressions.